If you can’t stand over-ear headphones, the Sony WI-1000X are a great in-ear alternative. The inclusion of aptX HD support makes the Sonys one of the best wireless headphones we’ve heard. While battery life may just be average, the WI-1000X are a great set of headphones for audiophiles on the go. Sony’s excellent WH-1000XM2 are the gold standard when it comes to active noise cancelling headphones but for some, the over-ear design may be a dealbreaker. If you wear glasses or plan on being active, an over-ear design is not ideal. If you fall into that camp, Sony’s answer is the WI-1000X. These wireless noise cancelling earbuds offer some of the best sounding wireless audio we’ve heard in a robust form factor that can survive the abuse of a daily commute or visits to the gym. The headline feature of the WI-1000X headphones is its excellent sound quality thanks to aptX HD support. For commuters and audiophiles on the go, the Sony WI-1000X should be on the top of the shopping list. While truly wireless earbuds like the Apple AirPods and Sony WF-1000X are all the rage these days, they still suffer from some growing pains. Pairing is finicky at times and battery life is much lower than the tethered competition. 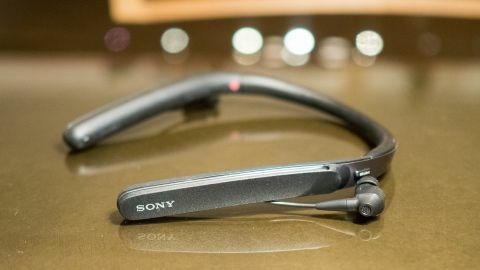 The Sony WI-1000X bucks the trend of even tethered earbuds with its horseshoe design that’s meant to be worn around the neck. This design means the headphones won’t fit in your pocket but they still manage to be slim and fit easily into a backpack or bag. The WI-1000X are surprisingly light, and were exceedingly comfortable during our coast to coast flight. The neckband is covered in padded leather and the buttons are rubberized to resist sweat and dirt. The microUSB charging port, located on the underside of the front-left arm of the headphone, is protected by a rubber door so these headphones will resist splashes and sweat. The earbuds themselves are a little larger than your average earbud since they also house the noise cancelling microphones. Sony includes various sized silicone ear tips to help you find the best fit - and the company also tosses in a soft fabric pouch for smooth, scuff-free transportation. For years, audiophiles have rejected wireless audio and for good reason; Bluetooth compression destroyed dynamic range, soundstaging, and detail. However, after listening to the Sony WI-1000X, which features aptX HD support, we think it’s finally time for audiophiles to embrace the wireless revolution. Listening tests were done using an LG G6, which supports the aptX HD codec. For the unfamiliar, aptX HD allows the transmission of 24-bit/48kHz audio vs the 16-bit/44.1kHz audio of regular aptX. This increased resolution helps Bluetooth audio regain the dynamic range that’s often missing with wireless audio. The result is a balanced sound signature that offers a ton of soundstage depth, especially for in-ear headphones. The Sony WI-1000X wowed us with aptX HD enabled, providing deep, rumbling bass while not sacrificing sparking highs and mellow mids. In terms of tonal balance, the WI-1000X are slightly warm in the mid-bass area, which makes them fun for mainstream music without muddying up the mids for vocal, jazz, or classical music. Noise cancellation is also excellent, though still slightly behind Bose. There's a slight hiss when noise cancellation is active without any music playing, something Bose managed to dial out of their headphones like the Bose QuietComfort35 II. On our coast-to-coast flight, the noise cancellation did an excellent job of drowning out the rumble of the jet engines and voices. Noise cancellation isn't the WI-1000X's only trick, though - Sony’s app adds unique features as well. On top of the typical EQ tweaks, the app allows you to adjust the level of noise cancellation so commuters can allow ambient noise to enter for situations like walking on a busy street. The app can also use your phone’s location and accelerometer to detect the activity you’re doing and will adjust the noise cancelling strength with a feature called Adaptive Sound Control. We found this feature worked well, but often with a delay when transitioning between activities. For example, the app would take anywhere from 30 seconds to a minute to detect when we stopped walking. Thankfully you can disable the activity auto-detect feature if you just want 100% noise cancelling all the time. Battery life is about average at 10 hours, which got us through our flight without issue. However, once you’re out of juice, you’re done listening to music. Unlike over-ear noise cancelling headphones, you won’t be able to switch to wired mode so bring a battery pack to charge on the go. One last thing to mention is that the Sony WI-1000X offers a “Noise Cancellation Optimizer,” which adjusts to the ambient air pressure. If you’re sensitive to the weird pressure that some active noise cancelling headphones give, you’ll love this feature. The Sony WI-1000X are an excellent pair of noise cancelling wireless in-ear headphones. The inclusion of aptX HD will make audiophiles happy and the excellent noise cancellation are a must-have for travellers - just remember to pack a battery pack since the headphones only offer 10 hours of battery life. In terms of value, the $300 (£300, $450) Sony WI-1000X are expensive but you get a premium listening experience for the price. These sound better than the $350 (£330, AU$500) Bose QuietComfort35 II, but the Bose have a slight edge in terms of noise cancellation. As a package, the Sony WI-1000X do so much right that it’s hard to fault it too much for its average battery life, lack of multi-point connection, and slow Adaptive Sound Control. For audiophiles who travel often, these headphones should be a serious consideration.